Judge Ronald B. Ramsey, Sr. began his professional career in Atlanta, with the National Labor Relations Board, a federal agency, after graduating with honors from North Carolina Central University in 1981. While working full-time as a federal investigator and hearing officer, Judge Ramsey enrolled as an evening student at John Marshall Law School. Immediately upon being admitted to the State Bar of Georgia in 1992, Judge Ramsey became a member of the National Labor Relations Board (NLRB) legal team for the ensuing two years. He also became a certified mediator during that period and remained a key member of the Justice Center of Atlanta’s mediation team for eighteen years. Judge Ramsey left government service in 1994, to become the Southeast Regional Counsel for the Laborers International Union. During that period, he also served as an adjunct professor at John Marshall Law School. Three years later, Judge Ramsey became the Director of Labor Relations and Legal Affairs for the DeKalb County Sheriff’s Office, where he served for nearly 2 years. In 2000, the Honorable Ronald B. Ramsey, Sr. was appointed as the first African-American to serve as a Municipal Court Judge in the City of Stone Mountain, Georgia, where he served until 2007. While serving on the bench, Judge Ramsey engaged in the private practice of law in the areas of criminal defense, labor and employment, business and probate law. His mediation and arbitration services also comprised a significant portion of his practice. Judge Ramsey was recruited to assist the DeKalb County School District to develop an internal investigations unit, where he became its first Director in 2005. In 2007, Judge Ramsey resigned from his judicial post when he took the oath of Office as a Georgia State Senator for the 43rd District, serving DeKalb, Rockdale and Newton Counties, while continuing his employment with the School District, where he was ultimately promoted to the position of Chief Legal Officer. 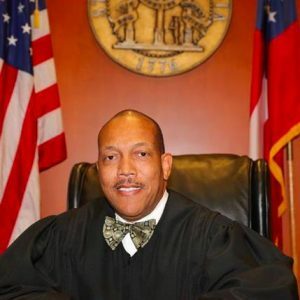 Judge Ramsey resigned his nine-year tenure with the Georgia Senate and his ten-year tenure with the school district to accept an appointment by Governor Nathan Deal as an Associate Judge of the inaugural DeKalb County State Court – Traffic Division. On May 24, 2016 Judge Ramsey ran unopposed and was elected by the citizens of DeKalb County to a four-year term to continue serving as Associate Judge for Division D of the DeKalb County State Court – Traffic Division. Judge Ramsey has been married to his wife, Doris, for over 31 years and they have two children both of whom are graduates of the University System of Georgia.